NOTE: Reservations (Max duration 2 hours) are required for use of the Laser Cutter. Please see the Reservation Calendar for more information. Laser cutters use a high-powered laser to cut and engrave wood, acrylic, metal, and other materials with extreme precision. Creating designs for use in our VLS 4.60 laser cutter is as easy as using Adobe Illustrator, Inkscape, Photoshop, or other image manipulation software, and exporting to the laser cutter as if it were a regular printer. While a variety of material can be processed with the laser cutter, care must be taken not to cut materials that contain PVC, flammable material, or pressurized gasses. Trained Maker Hub staff will be available to help visitors choose appropriate materials and run their jobs. Only Staff and Volunteers are trained to be authorized laser cutter operators. 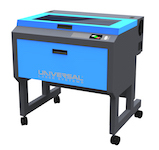 If you need help using the Laser Cutter, find one of them to help you. You need a reservation to use the Laser Cutter. Talk to a volunteer, or use the chat system to make a reservation. Only make a reservation if you plan to have a job ready to go and actually use the laser cutter.. Don’t make a reservation to do the DESIGN. Some supplies listed here may be out of stock, and we receive new consumables all the time. Please contact the Maker Hub to confirm supplies, or drop by to see what we have available. To learn more details, talk to someone with the Laser Cutter skill. USE SCRAPS BEFORE USING FULL BOARDS! Cutting area: 18" x 24"
The VLS 4.60 Laser Cutter is to be operated ONLY by authorized Maker Hub staff and select faculty. Maker Hub staff will be available during open hours to assist visitor with their projects. To learn more about designing for the Laser Cutter, check out our workshops, or request an individual consultation.